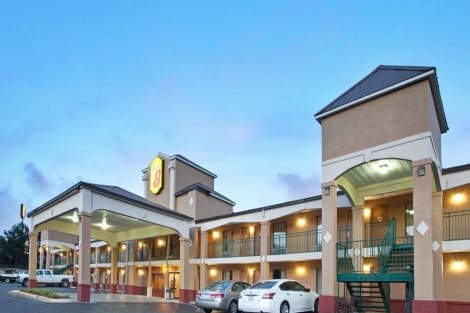 When you stay at Ramada by Wyndham Pearl/Jackson Airport in Pearl, you'll be near the airport, within a 15-minute drive of Mississippi Coliseum and Jackson Convention Complex. This hotel is 3.6 mi (5.8 km) from Brandon Amphitheater and 5.3 mi (8.5 km) from Trustmark Park. Featured amenities include a 24-hour business center, a 24-hour front desk, and laundry facilities. A roundtrip airport shuttle is complimentary (available on request). Featured amenities include a business center, express check-out, and a 24-hour front desk. A roundtrip airport shuttle is complimentary during limited hours. Don't miss out on recreational opportunities including an outdoor pool and a 24-hour fitness center. This hotel also features complimentary wireless Internet access and a fireplace in the lobby. Make yourself at home in one of the 80 air-conditioned rooms featuring refrigerators and microwaves. Complimentary wired and wireless Internet access keeps you connected, and cable programming provides entertainment. Conveniences include desks and complimentary weekday newspapers, as well as phones with free local calls.